Bienvenue! Xin chào! Velkomin! Welcome! West End residents and business owners can trace their heritage back to regions here and around the world. The West End is known for its cultural diversity and you can tap into some of that at Folklorama! Once a year, Folklorama gives Winnipeggers the unique opportunity to travel the globe in two weeks and learn about the many cultures that make Winnipeg a wonderful city to live in! Here in the West End, we’re proud to host several Folklorama pavilions, which we’ve highlighted below for you! Bem Vindos! Welcome to Minho, a northern province of Portugal that’s best known for its Celtic influence, lively music, dancing, and lush forests. Try Portuguese specialties including freshly grilled sardines or vinho verde (green wine) as you clap along to high-energy music and watch in awe of the spirited performers… only at the Casa do Minho Portuguese Pavilion! Velokmmen! Featuring countries such as Sweden, Denmark and Iceland, Scandinavia is a region best known for its famous Swedish meatballs (which actually originated in Turkey), cinnamon snail (Icelandic pastry), and powerful liqueurs. Pozdravljeni! Located in the heart of Europe, Slovenia is a tiny country located along the picturesque Alps. 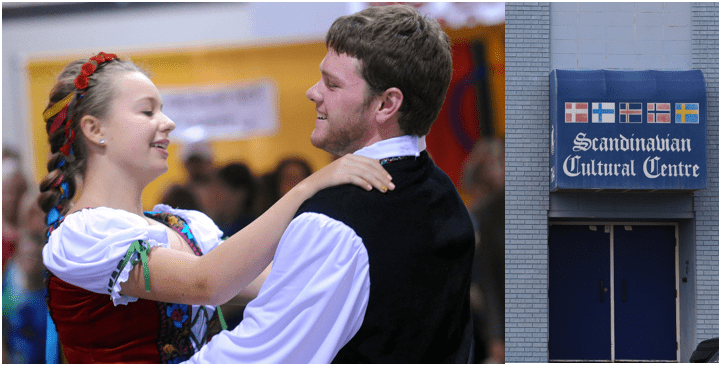 Come hear traditional Slovenian song, see vivid dancing and, of course, try real Slovenian cuisine (BBQ chicken, stuffed peppers and delicious sweets)! Portuguese Cultural Centre, 659 Young St.
Bem-vindo! Come experience the beauty and wonder of Portugal at the Pavilion of Portugal. Hear lively Portuguese music, see traditional dances, and taste everything from scrumptious seafood to authentic Portuguese beer! If you would like to learn more about Folklorama and the other pavilions they offer, feel free to visit their website by clicking here!